This is one of our easier quick dinner ideas, and it's one of our most popular recipes for kids. An easy mix of frozen chicken tenders, BBQ sauce, and crushed tortilla chips perfectly complement a bed of lettuce and corn for a tasty southwestern salad in no time. RecipeSavants.com This is one of our easier quick dinner ideas, and it's one of our most popular recipes for kids. An easy mix of frozen chicken tenders, BBQ sauce, and crushed tortilla chips perfectly complement a bed of lettuce and corn for a tasty southwestern salad in no time. Smart Recipes, American Recipes, Chicken,Vegetables Recipes, Recipes Chicken,Vegetables American BBQ Chicken Salad PT15M Serves 4 Ingredients: 14 Ounces Petite Diced Tomatoes 0.25 Cup Your Favorite BBQ Sauce 0.25 Cup Ranch Dressing 8 Cups Romaine Lettuce 0.5 Cup Whole Kernel Corn 8 Large White Tortilla Chips 16 Frozen Chicken Nuggets Cook chicken in microwave according to instructions on bag. Divide lettuce between 4 serving plates. Mix tomatoes, barbecue sauce and ranch dressing in a bowl. Spread mixture and corn evenly over lettuce. 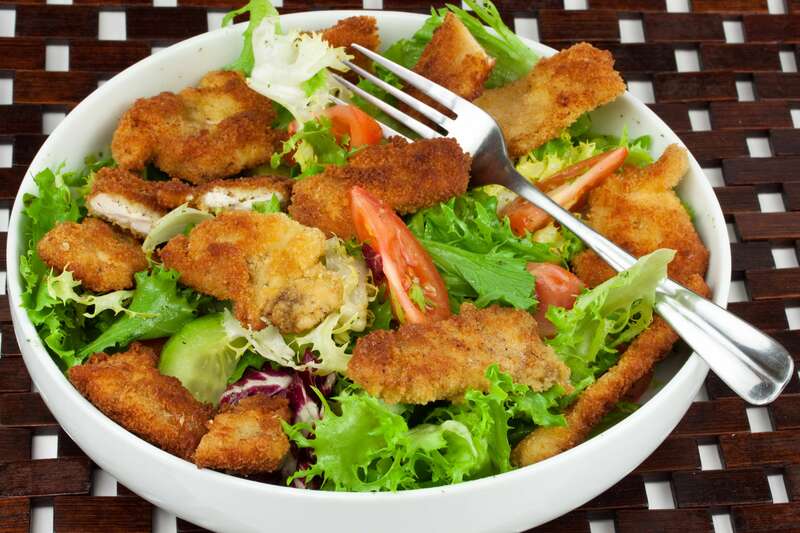 Cut the chicken tenders in quarters and add to salads. Add tortilla chips and serve.